7/25 Cup of Coffee: It was a tough day on the farm, as only two affiliates came out on top. Pawtucket won in the completion of Wednesday's game, and then cruised to another victory in the regularly scheduled contest. The DSL Red Sox were the only other victorious club. Among the losses, the most intriguing contest featured Portland as a Futures Game rematch took place with Henry Owens on the mound. Pawtucket prevailed 7-2 against the Lehigh Valley IronPigs (PHI) in a game that was suspended in the fourth inning on Wednesday. Travis Shaw (pictured, left) was 2 for 2 when the game was halted, and finished up 3 for 4 with a walk and run scored. Matt Spring, who drove in a run with a double before the delay, plated two more with another two-base hit in the eighth inning. Ryan Verdugo took the mound in place of original starter Steven Wright, and was dominant in earning the win. Verdugo fired 3 1/3 hitless innings, striking out three and walking only one. Miguel Celestino continued the effort with two perfect frames. He struck out three. In the regularly scheduled contest, Pawtucket never trailed in a 5-1 win over the IronPigs. Brandon Workman allowed the one run on five hits in six strong innings. He struck out six and walked one, and raised his record to 6-1. Tommy Layne struck out one in a scoreless seventh inning. Shaw again played a key role in the offensive attack, going 2 for 3 with a double and an RBI. Will Middlebrooks homered for the second straight day and is now 9 for 26 in his last six rehab outings. Ryan Roberts drove in three of Pawtucket's five runs, going 3 for 4 with two doubles, and Mookie Betts was 1 for 3 with a walk and two runs scored. 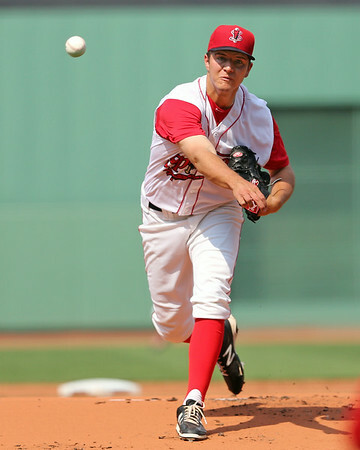 In a highly anticipated rematch of the pitching matchup of the All-Star Futures Game, Henry Owens took the mound for Portland against New Britain Rock Cats (MIN) phenom Jose Berrios. While Berrios was excellent, it was a rare off night for the Sea Dogs southpaw, and Portland fell 7-1. Owens failed to finish the fifth inning for only the third time this season, giving up five runs on five hits in four innings. He struck out six, but the four walks he issued ended a streak of nine consecutive starts with two or fewer. Even with the loss, Owens' 2014 record is a sterling 13-4 with a 2.56 ERA. Meanwhile, the Sea Dogs offense could not get going against Berrios. He allowed only three hits in seven innings, and two came off the bat of Blake Swihart, who doubled and scored the lone run in the seventh inning. After scoring 22 runs in the first two games of the series, Salem was shut out 5-0 by the Lynchburg Hillcats (ATL). Salem managed only five hits, and did not get a baserunner past second. Carlos Asuaje delivered two of those hits, and Matt Gedman's ninth inning double was the only extra-base knock. Most of the damage allowed by starter Simon Mercedes came in the third inning. He allowed five runs on seven hits overall through five, but four runs and five of those hits came in that difficult third. Mercedes struck out six and walked only one. William Cuevas tossed three hitless innings of relief, striking out seven and walking one. Greenville fell 8-3 to the Lakewood BlueClaws (PHI). The Drive had nine hits on the day but were only 1 for 10 with runners in scoring position. Cole Sturgeon was 2 for 4 with a walk and a double, and Zach Kapstein also doubled as part of a two-hit outing. Myles Smith took the loss, allowing five runs on seven hits in 5 1/3 innings. Jacob Dahlstrand gave up three in 2 2/3 innings out of the bullpen. A night after returning the the lineup after missing a week with a tweaked knee, Manual Margot again had the night off. Lowell was no match for the first-place Hudson Valley Renegades (TB), falling 9-3. After a trio of strong outings, fourth-round pick Kevin McAvoy (pictured, right) took his first professional loss. The former Bryant Bear had a tough box score, giving up five runs on seven hits in only 1 2/3 innings. However, SoxProspects.com Director of Scouting Ian Cundall was in attendance, and came away encouraged. He noted McAvoy was sitting 90-93 and mixed in a sharp slider, but a lot of the weak contact he induced managed to get through for hits. All of the seven hits allowed by McAvoy were singles. Ty Buttrey allowed four runs (three earned) on six hits in five innings as he continues to rehab from a broken hand. The five innings mark a season high for the left-hander, as did the five strikeouts that he notched. Ryan Harris followed with two shutout frames, allowing one hit and issuing a walk. At the plate, Sam Travis had a good night, going 3 for 4 with a double, RBI and a run scored. Mauricio Dubon drove in a run as part of his 2-for-4 night, and Bryan Hudson and Danny Mars had two hits apiece. Mars has now hit safely in eight consecutive games, and has reached base in 14 straight. A ninth-inning rally fell short, and the GCL Red Sox fell 5-4 to the GCL Rays. Brayan Villarreal threw the first inning for his first work since injuring his shoulder with Pawtucket on April 13. Villarreal allowed singles to the first three batters he faced, but one was cut down on a caught stealing, and he retired the next three in order. Jose Almonte took the loss, giving up four runs (three earned) on six hits in 3 2/3 innings. Carlos Garcia scattered six hits and gave up just one run in his 4 1/3 frames. In his second game since being promoted from the Dominican Summer League, Luis Alexander Basabe was 3 for 4 with a double and run scored. Derek Miller was 2 for 2 with a walk and two RBI after replacing Bryce Brentz in left field. Brentz was hitless in two at-bats while rehabbing from a hamstring injury. Trenton Kemp chipped in a pair of hits for the Sox, and Rafael Devers was 1 for 4 with a run scored. Devers has hit in five straight and has a .370 average since his promotion. The DSL Red Sox knocked off the DSL Rojos, 4-1, as Gerson Bautista continues his spectacular season. The 6-foot-2 right-hander fired six shutout innings, allowing only four hits. In 42 innings across nine outings, Bautista has given up only two earned runs, for a microscopic 0.43 ERA. He's allowed only 19 hits all season, with a WHIP of 0.857. Carlos Caceres allowed a run on four hits in his three innings of relief, notching his fifth save. Catcher Roldani Baldwin powered the Sox offense, delivering a two-run homer in the sixth inning, his fourth blast of the year. Jesus Perez hit his first home run, a fifth-inning solo shot. Isaias Lucena was 2 for 4 with a run scored, raising his batting average to an even .300. 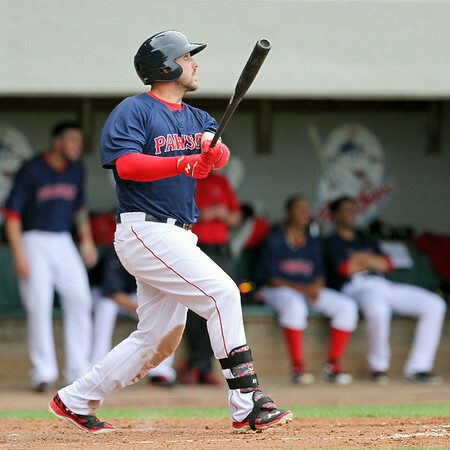 Player of the Day: Travis Shaw has been the catalyst of the Pawtucket offense in July. The first baseman has hit safely in all 20 games this month, delivering a .342/.437/.562 slash line. On Thursday, Shaw was 3 for 5 with a double and walk across two contests.